There is an issue with the user name and password box not appearing on the sign-in screen in the latest build of Windows 10, and KB3050653 fixes it. Microsoft released three updates for the Windows 10 tech preview earlier this week when it made build 10041 ISOs available. Today the company released another update that addresses an issue with the user name and password box not appearing on the sign-in screen, and the company has released KB3050653 to fix it. 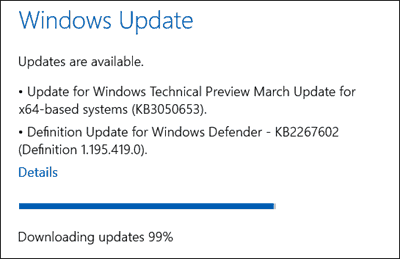 If you’re running the latest Windows 10 build, the update is available via Windows Update. Gabe Aul sent out the tweet this after noon which you can see below. Although I haven’t seen this problem with any of my Windows 10 test installs apparently it is a problem for enough users out there that Microsoft released this patch today. i can’t update my laptop any extranal link ?? You’re not able to get the updates via Windows Update? For now it looks like that is the only way to get the patches. I haven’t seen any external links yet. I don’t have a problem with the sign in box, but my problem is I can’t find my installed Microsoft office 10. It was deleted when I went from os 8.1 to win 10. I tried to load it from a copy on a usb drive, but it continues to fail. I asked if it was not compatible with OS 10 and was told it is. However, it still doesn’t install. Anyone have that problem with Office 10? @Joe are you trying to run Office 2010? or a different version? I upgraded an older PC from Windows 7 with Office 2010 to Windows 10 Technical Preview build 1041 and it made the transition fine. It is office 2010. Sorry I kept referring to it as office 10. It was loaded on my computer that was running win 8.1 til updated to win10. I lost the office 2010 on the first update to win 10. Since then I’ve tried to reinstall it several times. When this last update came out I desided to try again, same thing. It loads from the usb drive, loads the files, the office 2010 screen appears then after 5 or 6 minutes I get a message that the install has failed. No indication is given as to why its failing. I’ve used the usb drive before to install the Office 2010 on one other computer a long time ago and it’s working fine. I don’t think its the USB drive. Note the AU at the id entry – that’s because I’m in Australia; just click on the drop down box (at the top right hand corner of the page) and choose your country. If I cannot sign in how am I supposed to install this fix? @Keith. Found this on the internet: “When trying to login, users may encounter an issue where they cannot enter their username or password or the information doesn’t show in the text fields. Microsoft gave three options for resolving the issue. These options are to click the Switch User button, use Ctrl+Alt+Del, or to restart the PC/device”. Unfortunately those work arounds don’t work for me. Download 4/12/15 loss my SIM card recognition. Can not make calls. Will try to get a new SIM. Any others experience the same. Ziggy, Sorry it took so long to reply to you. I decided that I don’t want to do the win 10 thing until Microsoft releases it completed. To much of a hassle worrying it won’t work the next time I start the computer. I was able to load the office 200 pro with no problem, so it was the updates that knocked if off the computer. I downloaded the latest version of windows 10 preview and im completely stuck in the Login Screen. Found my login profile but it was highlighted in red and gives me no option to sign in. Even my NFC doesn’t work to sign in. Just completely stuck in the login screen. I do not know what to do. I have found that this bug is associated with Win 10 automatically resizing the display to 125%. On install, the view was set at 100% and the login screen was fine. AFter a few restarts, the OS changed the view to 125%, and this is when you lose the login screen. Change the view back to 100% and the login is restored. Settings>Display>100% on the slider. I installed redstone 10.0.14946 and after few days I noticed that the password box disappeared in the login screen after system restarts. Would you like to recommend this update to fix for this version of Windows? ?